Whoa! Steady on down there. 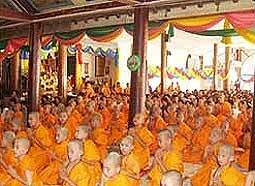 On 4-6 April, the Shan temple of Wat Papao in Chiang Mai held the annual novitiation ceremony, where 86 Shan boys were attired and honored as princes before being ordained as novices. 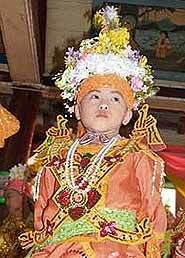 The ethnic Shan, also known as “Thai Yan” and “Tai Long” live in Laos, China, Myanmar, and Thailand. 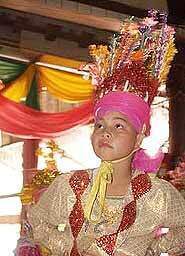 Particularly in the Thai province of Mae Hong Son. 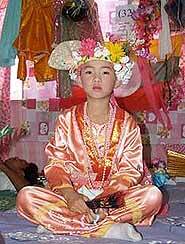 The Poi Sang Long ceremony ordains boys, ages 8-14, to be Buddhist monks, three days of festivity that involves dressing up as young princes and being honored as such, to the final moments of solemnity as the monks chant and the Abbot delivers his peroration. 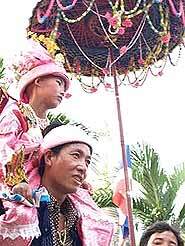 Once dressed in all his resplendent finery, each boy rides the shoulders of an older male friend or relative through the streets, shaded by another who carries a decorative umbrella. 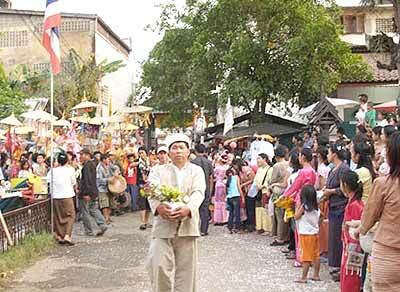 It’s believed that the ceremony re-enacts the story of Prince Rahula, the Buddha’s own son, who renounced the world to follow his father’s spiritual path. 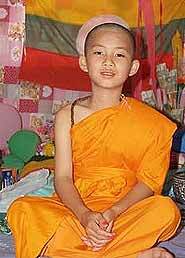 Most of the Shan are Theravada Buddhists and will be so ordained on the final day of Poi Sang Long, trading their jeweled costumes for a monk’s orange robes, sometimes for only a few days. 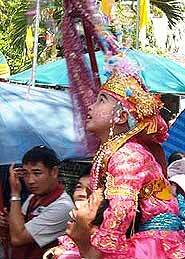 But the Poi Sang Long is as much a social event as a religious one. Pictures and story contributed by S.H.A.N. an independent Shan media group. It is not affiliated to any political or armed organization. News related to Shan & Burma, including other interested news items are collected and posted from time to time for your information. relationships in the form of a fantastic modern parable and a coward comedy. while SHADOW PLAY, a fantasy of foibles in one act, is written by Noel Coward and directed by Tony Preece. FAR AWAY is Churchill’s apocalyptic vision of a world gone mad; a world filled with corruption, ignorance, hatred, tyranny and violence. The play begins with a young girl (Joan) waking up in the middle of the night at her aunt’s house. She has seen and heard terrible things: blood on the ground, children screaming and her uncle in the midst of it all. As the young Joan questions her concerned aunt, a haunting situation begins to unravel. 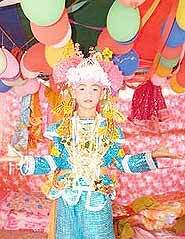 The aunt’s lies become more and more elaborate and the young girl’s search for the truth is muted. The second act takes place in a hat factory where Joan, who has now grown up, has taken a job. Here she meets Todd, a love interest. They live in a totalitarian state where management is corrupt and anyone who questions the system is at risk of losing their job. The third act takes the audience back to Aunt Harper’s house showing a world steadily hurtling towards disaster. There’s a war going on amongst humans, animals and weather; everyone has taken sides and no one can be trusted. FAR AWAY promises to be thought-provoking, visually stimulating and will bring a different kind of theatrical experience to Bangkok audience.. In SHADOW PLAY, the marriage of an elegant Mayfair couple, Victoria and Simon Gayforth, is coming apart at the seams – how utterly unseemly. After an evening out, Victoria, possibly in a drug induced stupor, is confronted by Simon who in a very Cowardesque manner suggests that it is time they divorce. In the space of one evening, Victoria and Simon retrace their marriage in a bid to reclaim and recover a love that was meant to endure. Sorting through their recollections and imagination, Victoria and Simon and some of the characters who have littered their lives, move in and out of the shadows of their past, in an effort to make sense of their future. SHADOW PLAY is one of Coward’s most intriguing and haunting looks at the human condition. BCT’s double bill of renowned English playwrights will be staged at MIFA (across from L’Opera), Sukhumvit Soi 39 on Fri April 28th, Sat April 29th & Sun April 30th at 8pm. Student Preview performance is on Thursday April 27th. Tickets at Bt 400 are available at the door. Student Preview Performance is Bt200 with valid ID. For more information or to pick up tickets in advance, please email [email protected] or call 06-787-5121 or 09-222-8430. Visit BCT website at www.bct-th.org for a map to the theatre.